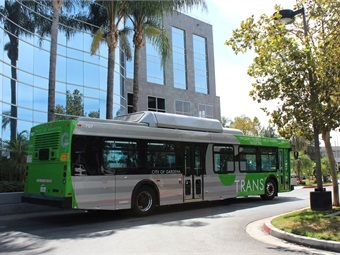 Complete Coach Works (CCW) announced the completion of a project to convert a gasoline-hybrid bus operated by Gardena Municipal Bus Lines (GTrans) to CCW's Zero Emission Propulsion System (ZEPS), an all-electric battery-powered engine. After the ZEPS bus was delivered in late September, Gardena received a California Energy Commission grant to upgrade four more of its hybrid buses to electric. Gardena selected CCW, once again, to convert the buses to ZEPS in a project expected to begin early next year, said Kevin O'Brien, project manager for CCW. "Gardena has been very impressed with the new bus," O'Brien said. "It has been in service every day and they are really happy." Switching to the ZEPS drive system entails dismantling the bus down to the chassis, then installing all new mechanical parts as well as new flooring, seating, power steering, HVAC and low-rolling resistance tires. The ZEPS engines have a range of about 130 miles and require about five hours to recharge the batteries. 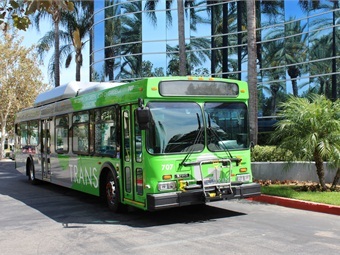 Gardena Municipal Bus Lines may be the only transportation agency in California operating with all gasoline/electric hybrid buses. "Certainly we're one of the few and we are evaluating if the fleet should go all electric,” Cohen said. The ZEPS conversion is just one of several projects GTrans has collaborated on with CCW.